I feel like I really do some things I want to. Following on from the Autumn quilt I wanted to make a scrappy, wonky log cabin. I just pulled strips from the basket and started sewing them on. Then I pressed them and cut them out to 15" square. I love the mixture of vintage sheets, designer fabric and spotlight fabric. These wee birds are particular favourites of mine. I think that's the last of it. 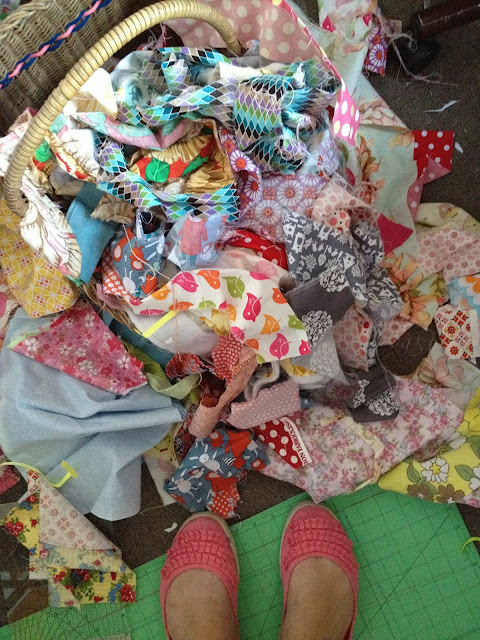 Here's the pile of scraps I chose for this quilt. Sadly I feel like I barely made a dent in them. Actually does anyone want them?? I'm pretty sure I could squeeze them in a bag. I just love using scraps, they are definitely my favourite. I made 12 blocks and then put a strip of this border print through one of the rows. I love how it's turned out. Isn't this print amazing? It's called Meet the Gang by Andover fabrics. Can't wait to get this quilted and bound! Next up either a bow tie quilt or another one that is going through my head. Got to use these scraps up somehow!! Love the colours in the scrap quilt!! Your autumn scrap quilt IS DELICOUS!! You are so talented deb! I love drooling over your makings!! Great quilt. I love the way you put all the colours together and your scraps are so way different from mine, love them! I think that if I did quilting, this would be my sort of quilt. I am just not made for tedious piecing, nor am I spectacular at the artist-styled ones. My girlfriend has a long arm machine, and would probably quilt for me if I asked her, but I think I lack the confidence to present a scrappy quilt to her, when she does so much high quality stuff. but someday I'd love to do a true scrappy fun quilt! Awesome quilt! Love the colours! YOu have such good colour sense. I too love scraps but silly me loves to cut them even smaller and then appliqué them onto other scraps.